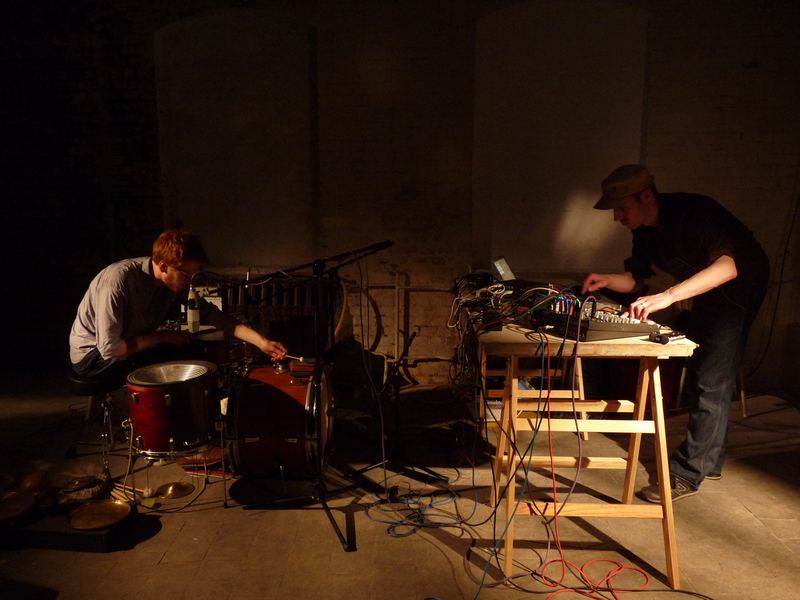 Wellenfell, is a series of performances by Boris Hegenbart and Jan Thoben. The term Wellenfell metaphorically combines the German words Welle (wave) and Fell (skin). Wellenfell, however, is about taking this metaphor literally. The project explores the sonic qualities of swinging membranes and resonant bodies by staging obvious parallels between the drum, the electro-mechanics of sound (re-) production and the human ear. Membranophones and loudspeakers imply the same principles as the eardrum: They transduce vibrations, a function which is fundamental to the mechanics of listening. The latin term membrana tympani (eardrum) clearly reflects this parallelism as the word timpani (it., derived from the greek term for kettledrum) still today names a particular class of membranophones in the orchestral percussion instrument family. The drumset understood as Wellenfell works in a manyfold manner. Initially, it functions as a percussion instrument in the classical sense of a sound producing configuration. It is played by both performers, manually and remotely using software-triggered solenoids. Thus the Wellenfell drumset juxtaposes aspects of musical automation and human playing. On the other hand the drumheads operate as transducers and as filters for attached loudspeakers of different kinds. The “Wellenfell”-setup implies the possiblity to establish feedback-systems channeled through the drumheads by attaching wired piezo microphones and loudspeakers at the same time. Standing wave-patterns may be generated according to the resonating properties of the membranes and shells. In this case sparse interactions by the performers will cause the system to change its behaviour. Moreover, having replaced the floorom-drumhead by a 15″ speaker allows to explore the percussive use of subsonic vibrations at the threshold of tone and rhythm.